This thread concerns historical recording studio gear and how it was used. It is prompted by my running across information about an exhibit at the 2000 AES (Audio Engineering Society) convention in LA called "When Vinly Ruled." The exhibit is a 1960's era studio control room and associated gear. I'd like this to be in Music Corner - it does involve hardware, but it is my hope that the discussion evolves into areas of production techniques and specific recordings - maybe, many things that go beyond just the attributes of different pieces of gear. I am asssuming Steve was probably there, since this convention was in Los Angeles. I hope so, and even if not, I feel sure he can contribute a lot to the discussion, if it interests him. I hope it will interest plenty of other members too, some of whom can relate their direct experience to using this stuff, and similar setups of this era. Apart from its utter coolness, the exhibit raised a lot of questions for me about how and when this gear was used. I figure SH Forums is the best possible place to get answers, right? I mean I don't know any other group as into recording and popular music history as you people. Please forgive me ahead of time if I ask things that are well known to a lot of you pro's that were there - I'm just here to learn. I have a lot of questions, so I'm not going to just start with a huge laundry list - if the thread generates interest and/or answers, I will post more questions - and please post your own. My first set of questions is somewhat general, and concerns the "guts" of this studio - the Ampex 1/2" 3 Track machine and the smaller Ampex 1/4" 2 track. During what approx. time period was this model most prevalent in pro studios - and how prevalent, in fact, was it? Were there similar machines from other manufacturers, or was this sort of "the standard?" My immediate thought is I am going to have to do a lot of this live, with everyone playing together and that eventually I am probably going to have to bounce tracks around, especially if this is supposed to end up on a stereo master. Was the 3 track, in fact, mostly used for mono? Every producer/engineer had their own methods, I would say, but is there sort of an overall method for creating a backing track, adding lead vocal and harmony vocals, and whatever "extras" were needed? What speed was generally used on the Ampex, was this a 7.5 ips machine? More, less? Finally (just to get this thread started without too many initial questions), how do/did these things sound? There's a tendency for many of us to almost automatically see vintage equipment as better and more musical, was this really the case? I have plenty more questions, but I hope there will be enough interest and comment to get to them later. The 300 series in its tube incarnation, was introduced in 1949, and manufactured into the mid-1960s. This was the flagship series for Ampex during their years of manufacture. They were available in 1, 2, 3, 4, and 8 track models. 1 and 2 track machines used 1/4" tape, 3 and 4 track models used 1/2" tape, and the big 8 track version used 1" tape. I'm not totally sure when the 2 track model first appeared (and there may have been staggered head 2 track models made to order early on, but I've never known of an example, only the regular in-line or 'stacked' head stereo that is the norm) but I'm sure they were established by 1955, when the first 3 track machines were produced. 1956 saw the first 8 track model, a custom product designed by, and made for, Les Paul. 4 track, I'm not sure; possibly first appeared in the late 1950s in conjunction with the need for duplicating equipment for the new quarter-track stereo reel-to-reel tapes then introduced. In 1965 Ampex began producing solid-state equipment. A short-lived series AG-300 was introduced that year, using somewhat updated cosmetics, but the same basic mechanism, in conjunction with newly-designed solid-state electronics. The 350 series was introduced in 1953. Used a direct-drive capstan (versus the idler driven capstan flywheel of the 200 and 300 series). The bang-for-the-buck workhorse range Ampex produced. Superceded by the AG-350 series in the mid-60s and shortly thereafter by the famous AG-440 series. Generally 1 to 4 track models prevail but I have heard of the odd 8 track version. The 300 and 350 series used the larger octal base tubes; the 301 and 351, 352 (a play-only model) and the later 354 all use smaller miniature glass tubes such as 12AX7, etc. Sound quality goes from very good to excellent. As for speeds: The 300 range were generally 2 speed machines available in adjacent speed pairs from 1 7/8--3 3/4 ips up to 15--30 ips. Three-speed models could be obtained on special order. There was a 3200 series built using the 300 transports, but running at (IIRC) 60--120 ips, used for tape duplication. The 350s are two-speed machines, with 3 3/4--7 1/2 ips and 7 1/2--15 ips decks the most common. The 7 1/2--15 version is the most sought after, though the other version is easily converted. If you want a recent example of the playback quality of a 351-2 stereo model, check out SH's work on the remaster of A NOD IS AS GOOD AS A WINK TO A BLIND HORSE by The Small Faces. He used his Ampex as the playback machine for the master tape. Other makers of such gear in the 1950s included Magnecord, Fairchild, Berlant and Presto. In the 1960s, Scully and 3M introduced solid-state decks of their own. Generally, 3 track was used to capture the orchestra (or accompaniment) in stereo on two of the tracks, with the main talent (singer) on the remaining track. Usually live (think Frank Sinatra, Nat King Cole, et al). The box under the 3 amplifier assemblies on the 300-3 in the photo is a Sel-Sync selector box (Selective Synchronisation). Overdubbing could be done by switching one or more tracks that already have music recorded on them to 'Sync', permitting playback off the record head, whilst recording on the other blank track(s), which had to be set to 'normal' mode for recording. All collectable machines well worth restoring and using today!! Thank you Perisphere, I knew someone here would know. Based on your information then, It seems unlikely that a pop or rock band would be recording on this setup in 1965 - at least if they were doing it under contract to a major label. Sounds like they were already at 4 or 8 track by then. I could certainly see how a 3 track 1" would be perfect for a stereo orchestra and lead vocalist like the ones you mention. Well, Steve, I tried to keep them somewhat specific. How about answering some parts that don't require book-length answers? Can you ask me each question individually? I'm not on my computer. Just post them here, one on each line..
Ok, will do, and thanks for your consideration. The exhibit is supposed to represent a typical pro studio of "the 1960's." By, say, 1965 would this be true that a major label pop/rock act would be recording on one of these 1" 3 tracks? Thanks, Tim. Different studios upgraded at different times. Columbia's Hollywood studio went 8 track at the end of 1964, while Gold Star didn't get 4 track until May 1966. Yep, many Herb Alpert/TJB and Phil Spector wall of sound productions were made on just three track equipment! The WORST OF JEFFERSON AIRPLANE album is one that is very instructive on the evolution of a group's recorded sound in terms of the number of tracks available when the songs were recorded, from some of their first album in 1966 (three track) up to some of the selections from VOLUNTEERS in 1969 (sixteen track). PS--the 3 track machines were half inch format. One inch four track was only used in parts of Europe and the UK, most famously at EMI Abbey Road Studios. By 1958 almost everything in a major studio was laid down on an Ampex 300-3 and simultaneously on an Ampex 350-1 mono machine. Was the standard formula of stereo recording a backing track, then adding the vocals on whatever open tracks were remaining pretty much "imported" into the rock realm? How'd they get all those terrific harmonies in there? No one ever did that with the three track. The four track with "Sel Sync" had that capability. Remember, overdubbing was forbidden by the union at that time. A song like "THE LION SLEEPS TONIGHT" by the Tokens on RCA was recorded live in the studio, music left and right and lead vocal on center channel (also a mono tape going at the same time). Then, the tape was (secretly) bounced to another three track and the center channel vocal was doubled. The mono bounce was deemed the master. The three track bounce was later mixed to a stereo two track tape for use on an LP..
Is this the kind of stuff you are looking for? 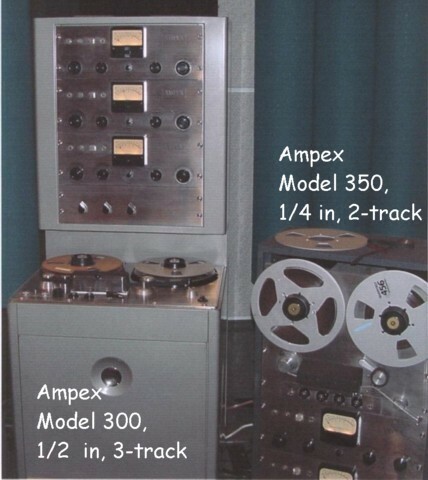 The 3-track Ampex 300 was used from 1955-1965 in common use. Most major studios began using 4 and 8 track recording by that time frame. Most sessions were recorded simultaneously on Mono full track 300 or 350 Ampex recorders. Consoles then were usually custom built out of Altec Lansing and Langevin modules or were modded radio broadcast boards. Usually rhythm tracks were done live and overdubbing mainly confined to strings and unusual instruments. The vocals were often recorded live too. Sound balances were done during rehearsals and takes were usually live for the most part. Microphone setups were usually not much more than 8-12 maximum. Smaller studios used full track Ampex 300 or 350 machines and no more than 2 tracks. Ampex 350 recorders were full track mono or 2-track stereo 1/4" only. Yes it is, thank you. Overdubbing forbidden, wow, I had no idea. To my ears that Tokens' recording sounds very, very good. Regarding the Jefferson Airplane recordings, they do not (at least the ones I know) - maybe they really needed those extra tracks. So, eventually overdubbing had to have gotten less "secretive" right? Surely many of these bands and performers had never even heard of a union when it came time to record. Thanks Kent and Dongle. I'm always up for a vintage photo, and I really want to get a feel for how things were done during this time period. I know it had to have varied a lot depending on budget, location, staff, etc. Looks like the boards prior to the '71 photo essentially have two knobs per channel - a mic pre gain and a post gain for the mix? I guess in most cases pan pots were unnecessary. The presence of ash trays sure is a sign of the times. Also interesting to see how the chairs changes over the years. Some of those - including the ones at the desk - don't look too comfortable. Great thread and thank you for the vintage photos. I love seeing the equipment that was used to record and mix these treasured hits. Awesome thread and great link to the AES convention/tech notes, Tim S.! for the first two classic albums, MTM and TTT, at Columbia Studio A.
rhythm track, which was supposedly laid down first. some of the vocals. I'm assuming that most of the other studios were quite a bit smaller. analog compression, and a less 'punchy' sound such as found on MTM? Any feedback, input from you folks in the business would be appreciated. were more technically advanced than their British counterparts. We think alike, Dyno - this is the kind of information that I'd like to know, too. Basically, lots of this stuff is documented because of the Beatles, George Martin, and their associated engineers. For the American scene and bands like the Byrds, I suppose there isn't enough general interest for books that focus on recording details. I'm a big Terry Melcher fan, too, for the Byrds recordings and also Paul Revere and the Raiders. I'm going to toss out some observations, such as they are, and figure I will be corrected by those with a lot more knowledge than me. The consoles like the United Audio described in the AES link were tube, and as Kent said, often broadcast consoles were used in studios - basically because if you wanted a flexible, multi-input console for music recording you had to build it. ...but I don't know if anyone else was doing it that early. My guess is that by the time of the Byrd's recordings, if Melcher had an 8 track, he also had some sort of solid state console - but, I can't say for a fact. Seems like every studio or session photo I see from back then shows Neumann mic's. There were famous mic's from other manufacturers, but I don't think it was at all like it is today, with so many brands and types. Obviously there were other famous ones like the RCA 77 ribbon and the AKG C-12. I've also seen films of rock bands in the mid 60's where basically every microphone is a Sennheiser 421 - but this may have been a European thing, not common in the U.S. I hope some people can clarify or correct some of what I've said. I wish there was a huge, coffee table book called "Popular music recording in the 1960's: the studios, the people, and the gear - with tons of huge, high quality photos and memoirs of those behind-the-scenes" - there isn't, so I'm trying to pick a lot of brains here. Neumann mics- that's my impression too. recording work with surf groups like the Rip Chords, and his own stuff. of role did those studio engineers play back in 1964-66? How important were they to the recording process? that would give us more info than we have now. I agree completely! I'm really enjoying this thread. Hard to believe that some of the records we treasure came out of studios like those pictured. I know time marches on, but by today's standards, they look very primitive. On the other hand, some of the best audio we know came out of those studios....so you can't judge a book by it's cover. Recording for the Volunteers sessions began on 3M eight track machines. The album was completed on Wally Heider's first sixteen track machine delivered to the San Francisco studios. The sixteen tracker was an interesting hybrid made by Jeep Harnard of MCI fame. Jeep's recording amps were nearly clones of Ampex 440's. The Ampex 300 deck was converted to handle two inch tape (the guides groaned and squealed as tape spooled from reel to reel).